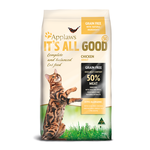 Applaws Grain Free Chicken Dry Cat Food is a grain-free, natural, complete balanced dry food for adult cats. While many other dry cat foods contain grains as their primary source of protein, Applaws understands that cats are carnivores and dont digest grains easily. Applaws has designed their cat food to be grain-free, and to contain as much meat as possible to properly nourish and support a carnivores wellbeing. Meat used contains no carbohydrate, to keep your cat trim and healthy. Suitable for adult cats as a complete balanced diet. Not recommended for growing kittens or lactating females. See the entire Applaws cat food range. I've been feeding my 2 cats this product for well over 12 months now. Following the feeding guide has helped reduce obesity in one of my cats (bit of a piggy). Both of their coats are shiny, soft and healthy. Their breath smells less, as well as their poos. I noticed about 5 months ago they changed the size of the biscuits, making them a little smaller, which is good for cats who may struggle with larger biscuits. My cats enjoy it when I make treat balls out of toilet paper tubes, or make a pyramid from them, or even just hide small portions of biscuits around the house so they can engage in some natural hunting behaviours. They love this food which makes creating enrichment for them an easy task. For cost effectiveness, I've found its cheaper for me to buy 4 bags of 800g (at Coles, $8.50) for $34, giving me 3.2kg. Versus spending the same amount on the 3kg bag. My cats have started to like this food after a few weeks of being unsure. They always have natural dry food, but this one have lessened the odour of their poo. So sticking with it. My cats don’t eat with love, but their poo is less smelly and the fibre is good for them. Both cats eat eventually, but the ingredients are good for them.